Dipylon society participated in the 11th International Conference of the Hellenic Geographical Society (ICHGS - 2018), which took place at the premises of the Lavrion Technological and Cultural Park on April 12-15, 2018. 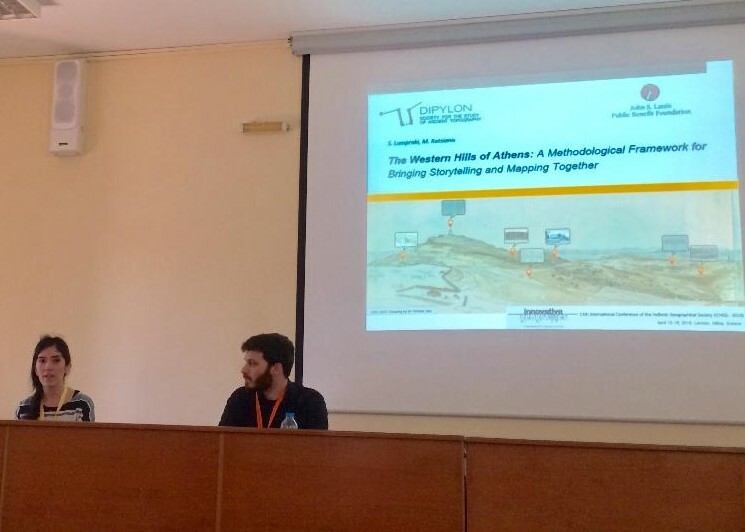 In our presentation entitled “The Western Hills of Athens: A Methodological Framework for Bringing Storytelling and Mapping Together” we focused on the challenges facing the archaeological sites within the urban environment and we emphasized the value of archival material for the study of their successive transformations. In particular, we proposed a methodology which combines cartography and narration and employs the capabilities of geoinformatics in order to convert archival material (maps, archaeological drawings, descriptions of early travelers, images, sketches, etc.) into a spatiotemporal dataset, capable of presenting the successive transformations. Emphasis was placed on the transformations of the relief, the road network and the archaeological remains of the West Hills of Athens. This paper is part of Dipylon's project on the Western Hills of Athens, which is funded by the John S. Latsis Public Benefit Foundation.